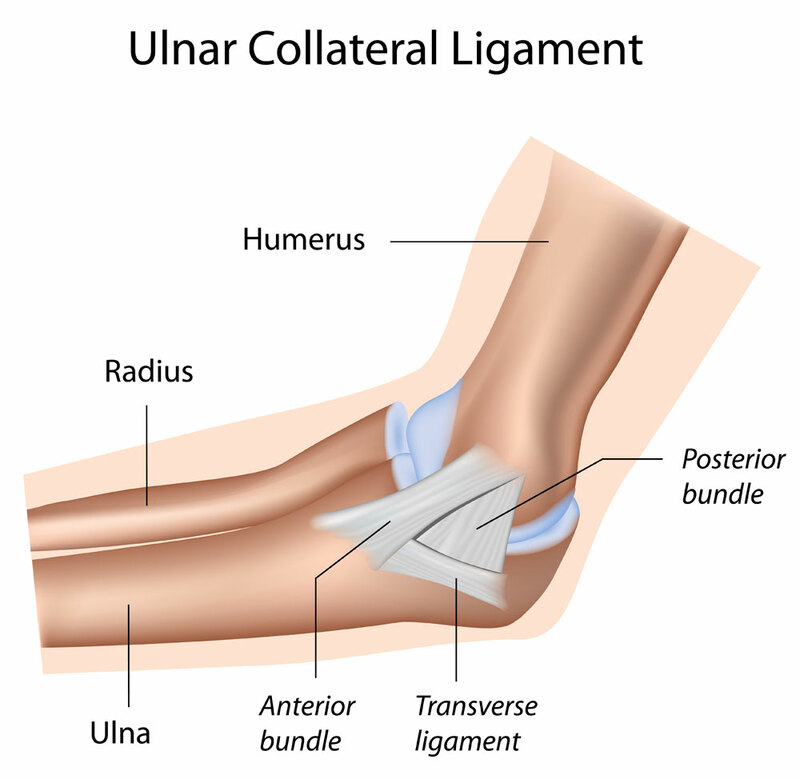 The ulnar collateral ligament (UCL) is a thick, triangular section of tissue that runs from the inner side of the humerus to the inner side of the ulna. The UCL is designed to withstand a large amount of stress as it stabilizes the elbow joint. Athletes and other active individuals may experience an ulnar collateral ligament tear from repetitive overhead movements. Dr. Waterman will perform a medical review and physical examination of the shoulder to reach a diagnosis. He will perform specific tests to determine areas of tightness and looseness. A valgus stress test is a common test performed to test the elbow for stability. During this test, Dr. Waterman will place pressure toward the inside of the elbow as the joint is moved in order to observe gapping of the joint and reproduction of medial elbow pain. A series of X-rays will typically be performed to look for bone spurs or other bone abnormalities. An MRI is performed in many cases to diagnose the extent of the ulnar collateral ligament tear. The treatment of a UCL injury depends on patient’s age, patient’s activity level and extent of the ulnar collateral ligament tear. Dr. Waterman will explain all available treatments at the time of consultation. A mild UCL injury is typically treated with non-surgical measures such as rest, ice, anti-inflammatory medications and a physical therapy recovery program.Dr. Waterman may also recommend the athletic player’s mechanics be evaluated and corrected, if needed. If the UCL injury is too severe or doesn’t respond to non-surgical treatment,Dr. Waterman may recommend surgery. Many cases of an ulnar collateral ligament tear are treated using an arthroscopic reconstruction procedure. Known as the “Tommy John” procedure,Dr. Waterman will use a patient’s own forearm tissue to reconstruct the damaged ligament. In cases where a patient’s tissue cannot be used, a donor tissue (allograft) will be utilized.